How to wear my black dress for a work christmas party? I have been following your blog for years, and I’m in need of some advice. 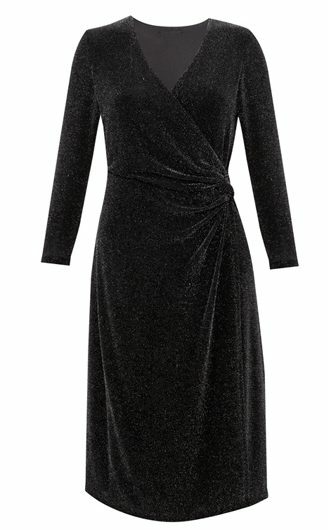 I have a work Christmas party coming up, and was thinking of wearing a dress similar to the one in the picture, but with a boat neckline and a slit down the leg, and it is midi length. The party is a black tie event, any ideas of how to style it? Really like this wrapped style à la Diane von Furstenberg with the slit on the leg. It is quite easy to make a LBD look stylish: use great accessories! Shoes, a clutch, earrings, tights, lipstick, bracelet(s), ring(s) and OF COURSE, stunning shoes! They could be colorful, even printed or black with different textures. Here are some outfits you could impress your colleagues with. Red and black is a classic mix. The balance between the two is hard to find though. Since a fifty-fifty may look kind of gothic, so I suggest you to rather do do an 80/20. Or even mix several colors. The key really is to play with textures and light. Here the shoes shine, the bag also in a different manner, the lips are matte and the earrings create a white ray of light. For this second outfit, I went for more eccentric items that all work together thanks t the neutrality of the black dress. They all have this same exotic sophisticated look. The makeup can be subtle and baroque with smokey shiny brown eyes and dark lips. So, ready to be “la plus belle” at your party? Je vous souhaite tout d’ abord une très heureuse et joyeuse année 2017! Je me délecte de votre blog depuis plus d’ un an déjà 🙂 et vous remercie pour tous vos précieux conseils. J’ ai craqué sur un pull bleu électrique en cachemire en col V (princesse tam tam) mais voila, je n’ ai pas trop d’ idée pour sublimer cet achat. J’ ai une carnation noire , suis ronde et mesure 1,60m. J’ aime les jupes. J’ espère avoir le plaisir de vous lire. N’hésitez pas à partager mon blog avec vos amies! Normalement l’association rouge et noir ne me plait pas …peut-être parce que le Noir et moi ça fait deux ?! Mais je dois reconnaître que là, présenté comme cela avec les rouges dans differentes tonalités et en touches ( pochette, R.A.L été vernis) , ca me laisse beate d’admiration … Sincèrement.